Get a CRM marketing solution that is flexible, easy to use, and engineered to fit your business. Transform every touch point into a marketing opportunity and harness the undiscovered potential within your customer base. With familiar and intelligent marketing capabilities in Microsoft Dynamics CRM, you can market more effectively, improve productivity, and gain actionable insight into your marketing efforts. Jet Enterprise is a complete Business Intelligence solution designed specifically for Microsoft Dynamics ERP – from Jet Reports, the leading Microsoft Dynamics reporting solution trusted by over 50,000 users in 89 countries. This revolutionary self-service software offers you in-depth Business Intelligence and Reporting inside an application that you already know – Excel. Jet Enterprise enables every end user in your organization to create and share key information and reports, with no need to know how to write formulas or require the skill-set of a programmer. The intuitive drag and drop interface inside Excel allows anyone to visually manipulate data to see the information they want. "What if" queries use a streamlined data set, with no churning through the entire database to retrieve data – answers are automatic. So, while traditional reporting methods can take up hours to process and produce, thanks to Jet Enterprise, it can take as little as seconds. With Jet Enterprise, you get a data warehouse that is optimized for reporting. Relevant information about topics are combined in single tables. As a report writer, you no longer need to jump from table to table to find all the information you need for a report. This makes generating reports quick and seamless. If you have customized tables or fields in your database, these can be added to your data warehouse in minutes using the Jet Data Manager. And because the data is held outside of the ERP platform, there’s no load on your ERP system and user's actions have no effect on production environment performance. There is no need for a highly skilled programmer to interpret your requirements and do the coding with Jet Enterprise. It's truly self-service BI and reporting. Jet Enterprise enables you to create and manage information through an integrated system that includes core business productivity features that makes every part of your workplace highly efficient, resulting in cost savings and low total cost of ownership. And, thanks to very attractive introductory pricing, you have the opportunity to acquire Jet Enterprise and experience immediate value in hours, not days, weeks or months. Your users already have the skills to be successful with Jet Enterprise. This allows business person-to-business person collaboration without the need for a highly skilled technical resource to be in the middle of your business analysis conversations. The intuitive drag-and-drop data manager easily adds tables or data fields to the cubes to access the data warehouse, making it simple to modify the Jet Cubes in a meaningful way and manipulate data to see the information you want. Jet Enterprise can be implemented in just hours, so you gain valuable insight into your business almost immediately. There is no need for expensive technical resources to maintain or modify your BI tool and there is no load on your ERP system. With Jet Enterprise you get Business Intelligence and Reporting in one solution that can quickly meet all your business information needs. Do strategic or ad hoc analyses quickly. Schedule reports for automatic update and distribution on a daily, weekly or monthly basis. 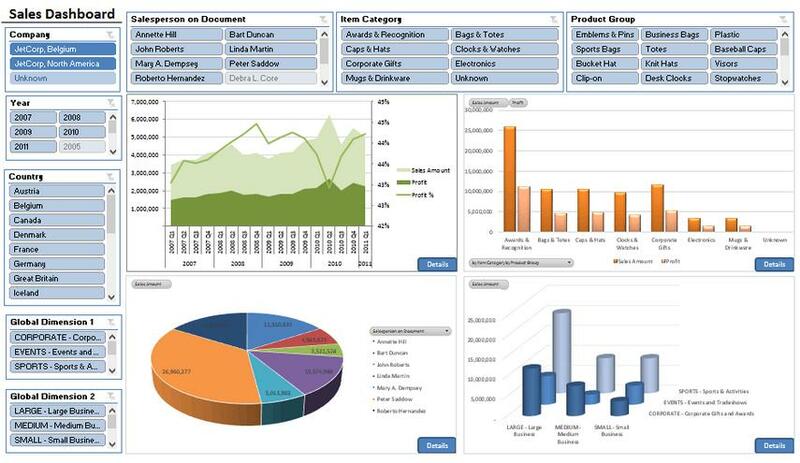 Simplifying Business Intelligence for your organization. Business Intelligence allows your organization to access and view business information from many angles and perspectives, helping you make more informed decisions. The key benefit of the Jet Enterprise solution is that you get all these benefits in a secure environment using the same familiar interface for both reporting and BI. Get lightning quick answers and immediate ROI. Easy to Install. In hours instead of days. Easy to use. Completely integrated into Excel. Easy to change. Intuitive drag and drop interfaces. ©2012 NaviWorld Vietnam Co., Ltd. All rights reserved.